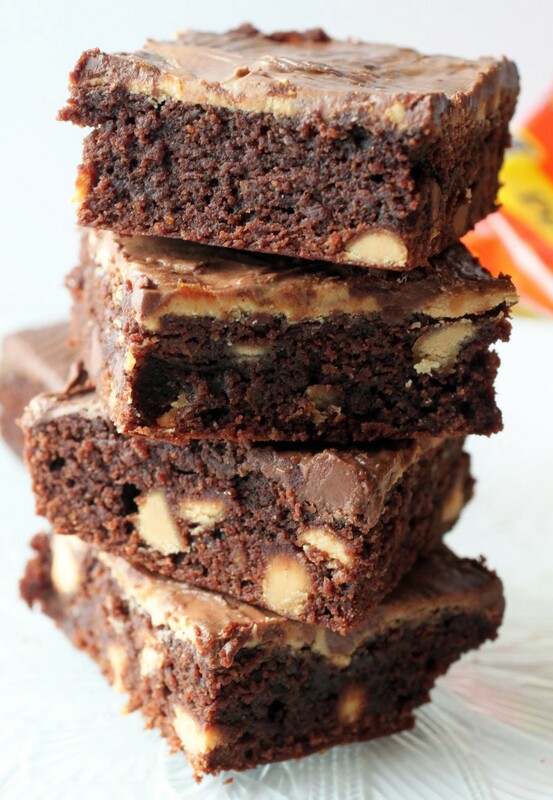 Have you noticed that I like to put brownie in almost everything? Sorry, kids, but an addiction is an addiction. And I don’t want to get help. Many years ago when I was a sparkly newlywed, someone went off the registry and got us a trifle dish. At first, I was confused. What on earth was this vase-bowl hybrid thingy? But years of experience and some research cleared up my fog. And I learned that trifles are actually quite nice. More traditional trifles have whipped cream and berries inside of them, but if you’re getting to know me, then you realize that I can’t go without chocolate. Preferably with peanut butter. 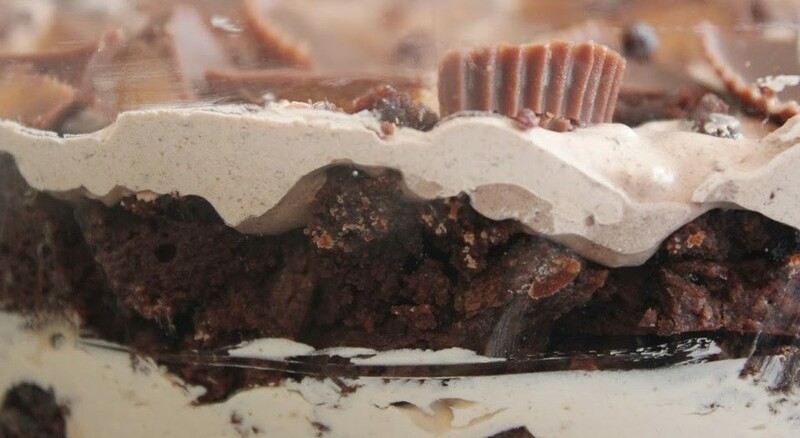 It’s a layer of brownies filled with mini peanut butter cups and peanut butter chips followed by layer upon layer of chocolate mousse, peanut butter mousse, peanut butter cups, and of course, more brownies. It’s a little bit decadent. And when I brought it into work, the interns ripped into its daintiness with giant spoons and decimated the whole thing in thirty seconds flat. Too bad, because it was so pretty before that. But hey, better that people enjoy themselves. 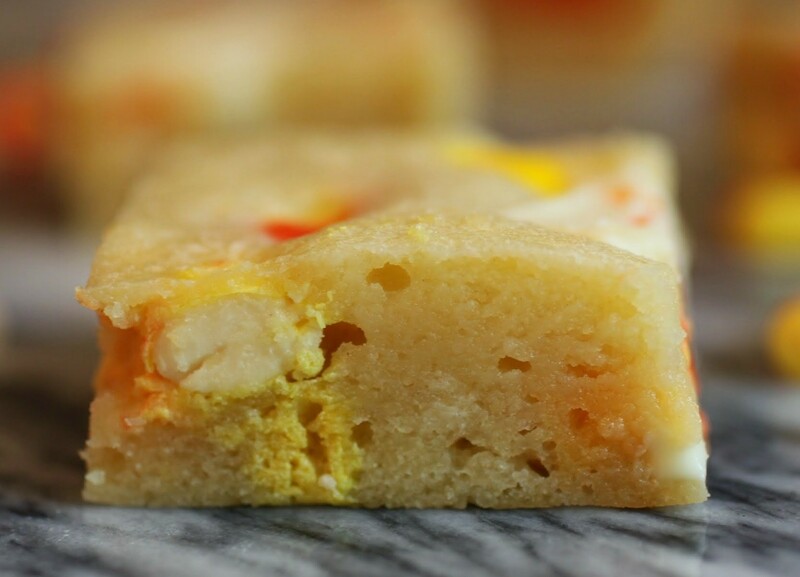 The only desserts that hang around are the bad ones. 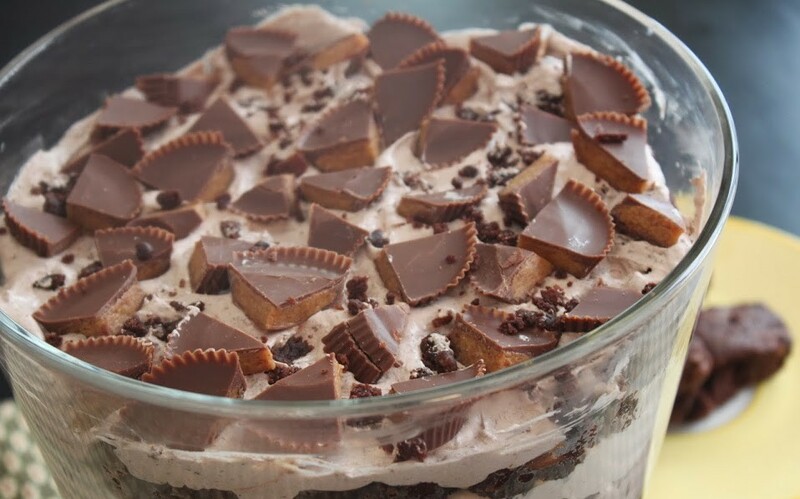 For you peanut butter cup enthusiasts out there, this recipe is lousy with them. 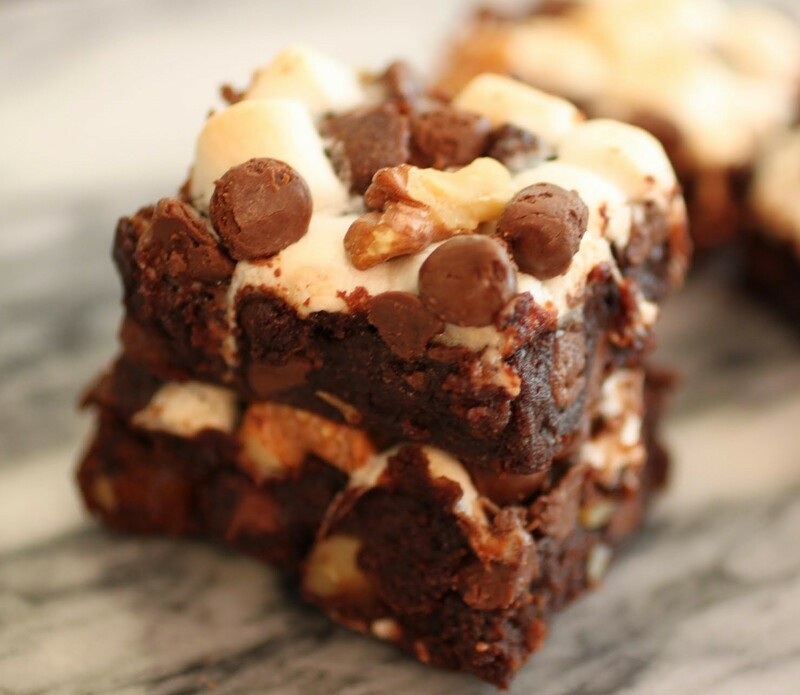 They’re in the brownie batter, there are mini cups between the layers, and then I chopped up snack-sized cups in uneven triangles and placed them gently on top along with some brownie crumbles. 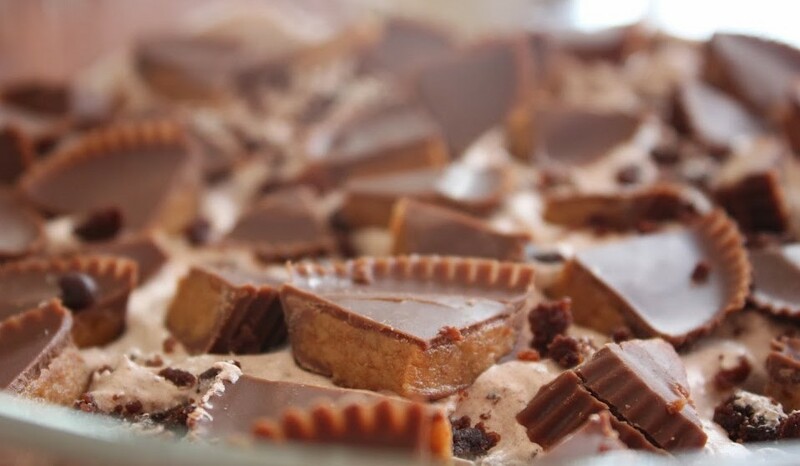 It’s a happy sea of peanut butter cup goodness. And the rest of it is pretty easy to make, too. My grandmother taught me how to make mousse with chocolate chips and Cool Whip. I decided to do the same with peanut butter chips, and that resulted in the alternating mousse layers. It looks like it took forever, but really, it was kind of a breeze. Which if you think about it, dessert should be. Every now and then I do really detailed recipes, but some of them should be just as easy to make as they are to eat. Or to serve to starving interns. Sorry, she wanted a close-up. But now you can see the brownie and mousse in all its glorious detail. 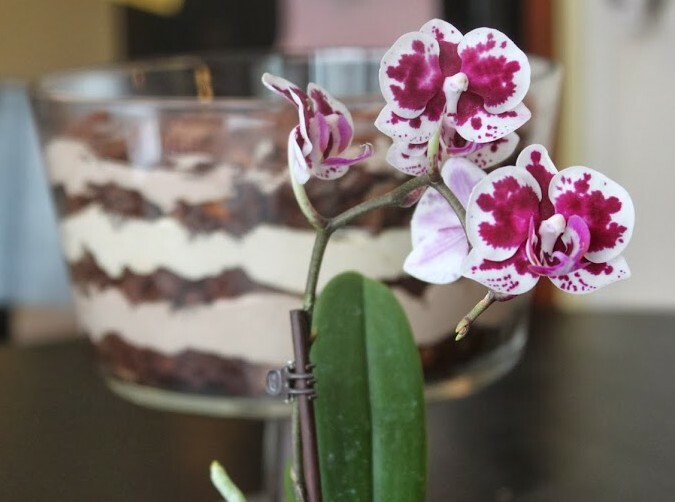 Since this dessert made me so happy, I decided to show you the other thing that makes me happy this week: this orchid. It’s called an ice cube orchid because you put an ice cube in it once a week and that’s all the care it needs. For someone who loves flowers but has a hard time keeping them alive (ahem), that’s pretty user friendly! Okay, okay, I’m done. For now. Trifle time! Preheat the oven to 350. Spray a foil-lined 9 x 13 pan with cooking spray. Combine the melted butter and cocoa until smooth. Add the sugar and mix thoroughly. Then, add the eggs and vanilla and stir again until the ingredients are incorporated. Add the salt and the flour, stirring until everything is combined. Fold in the peanut butter cups and peanut butter chips. Pour the batter into the pan and bake until done, about 30 minutes. Do not overbake. In the meantime, take two microwave-safe bowls and put the chocolate chips in one and the peanut butter chips in the other. Doing one bowl at a time, follow this process: melt the chips in the microwave for two minutes and then stir. Microwave again in 30-second intervals, stirring after each interval until the chips are melted. Gradually, stir 8 oz. (half the container) of Cool Whip into the bowl, making sure the chocolate and cool whip are fully combined and there are no white streaks. Once the two bowls of mousse are done, set aside. When the brownies are out and have cooled enough that you won’t get burned handling them, start making layers. 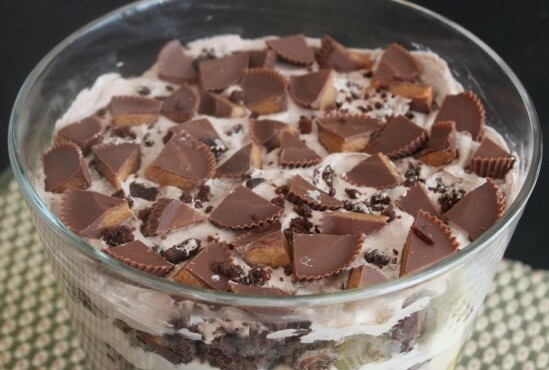 If you have a trifle dish, great. If not, use a pretty bowl. Crumble a layer of brownie onto the bottom and press it firmly down, making sure the brownie covers the bottom of the bowl. Then, put on a layer of chocolate mousse and spread it to cover the brownies. Sprinkle on half of the mini peanut butter cups. Gently crumble on another brownie layer, trying to get as much of the area as possible covered, but do not press down. Cover that with a layer of peanut butter mousse, and then the remaining mini peanut butter cups. Finally, put on the last brownie layer (you may have a bit left over), using the same method as before. 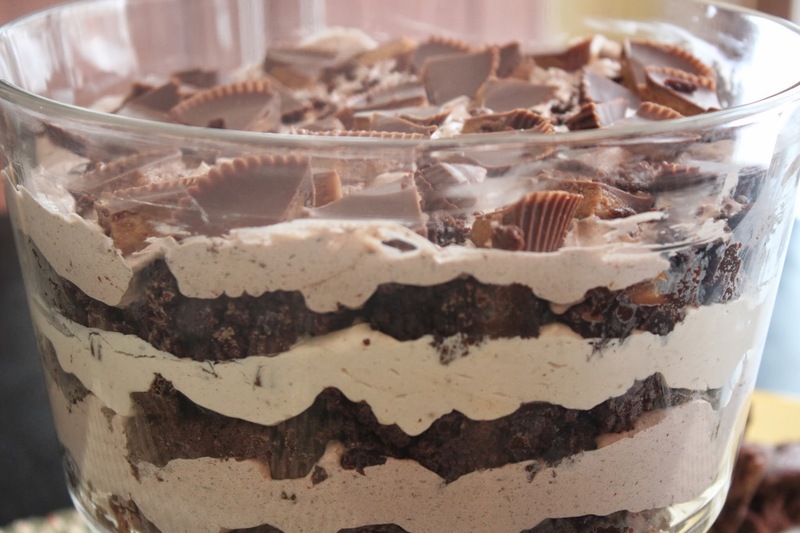 You can take any leftover mousse (chocolate and peanut butter), combine, and use that for your top mousse layer. Take the chopped peanut butter cups and place evenly over the top layer. If you have leftover brownie, you can crumble that onto the top layer. Cover the trifle in plastic wrap and chill it overnight. It will be ready to serve the next day! I’m all about food hybrids, y’all. It’s even more fun when they have cool names. The Cronut? Sign me up. I just wish I’d thought of it first. But beware, because the Bronut (i.e., a brownie/donut mash-up) is totally mine for the taking. What can I say? It’s a dream, a glint in my eye, but it’ll happen. And the Pake? I didn’t make that one up, but who can object to pie and cake together? Or the Pookie? I love cookie and pie in the same place!